Webcam is short for web-camera. 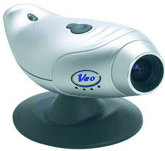 A webcam takes repeated snapshots and broadcasts them over the Internet. A digital camera in contrast takes a picture only when you click the button. 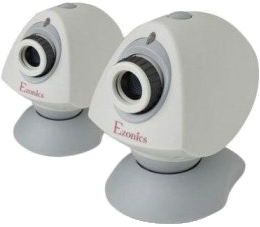 Webcams typically produce low quality images, one every few seconds, usually at 320 × 239 resolution. These are called snapshot webcams. They have the advantage people can access them even if they only have a dial up Internet connect. Further, your ISP (Internet Service Provider) won’t charge you for broadcasting too many Internet packets. They work by basically by serving jpg images to the world from the computer with the camera. The webcam software changes the jpg image every few seconds so that when people use their browser or a special viewer such as NetworkCam, to look at it, they see the latest version. The viewer automatically requests a new image every few seconds. To a browser, the image looks like any ordinary jpg image, it is just replaced extraordinarily frequently by an updated one. 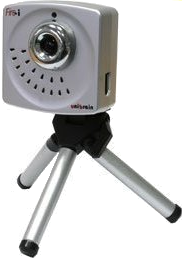 Higher quality webcams send a continuos stream of images, as fast as the receiver can accept them. These are called Streaming webcams. Cheaper ones send jpg images wrapped in an RTP stream protocol. High end ones send mp3 images, possibly also with sound. The catch is the number part, the IP (Internet Protocol), does not necessarily stay fixed. You need to use a service like DynDns to get around this problem and give your camera a permanent name. Rated #2 by Good Housekeeping. Low cost. Includes a pair of cameras and a pair of headsets. I don’t know about its Java support. 352 × 235 pixels. Rated #3 by Good Housekeeping. For the Mac, SuSe Linux and PCs. I don’t know about its Java support. 640 × 233 pixels. Rated #1 by Good Housekeeping. I don’t know about its Java support. It has a fun feature to convert your image to an animated avatar. It has RightLight to correct poor lighting. I has a Zeiss lens. It unusually good at having no lag in the picture or sound. Records or streams 960 × 720 pixels. Stills at 1600 × 238 pixels.